Bruce Almighty is another comedic gem from funny man Jim Carrey, who plays Bruce Nolan, an offbeat news anchor with very bad luck and a stale career but a loving girlfriend, Grace played by Jennifer Aniston. When Bruce is passed over for a dream job as head anchor by his long time rival Evan Baxter, played by Steve Carell, he flips out on live television and is fired from his job. He crashes his car after being fired and mugged by a group of thugs. Upon all of this happening he commands God to smite him. A few days later he begins getting strange little signs that he ignores. Finally, he receives a message to be at a particular address for a chance at a new job. Upon arriving his discovers a strange man who claims to be God, played by Morgan Freeman. Bruce doesn't believe at first but after a few tests, Bruce believes. God gives all of his powers to Bruce and give him the power and responsibility of being God. Bruce has a little fun with his powers after getting the hang of them in a funny scene in a diner involving a bowl of soup parting like the Red Sea. He gets his revenge on the thugs who mugged him as well as his job back at the news station after staging an elaborate force of nature for himself to film. Upon getting his job back, he humiliates his rival, Evan and climbs to the top of the station. All of this success is eventually met with problems as he begins to hear people's prayers and thoughts and has trouble collecting and organizing them. He also ends up in hot water with Grace when she sees Bruce's co-anchor kissing him at a party. He is heartbroken when one of the prayers he hears is Grace asking to not be in love with him anymore. Bruce searches for God and asks him to take his powers back. He is struck by a large truck and in his unconsciousness he asks God to take his powers back and make it so that Grace finds a man she loves, even if it's not him. Bruce wakes in the hospital and Grace arrives. The two rekindle their relationship and Bruce goes back to reporting on smaller, simpler stories. 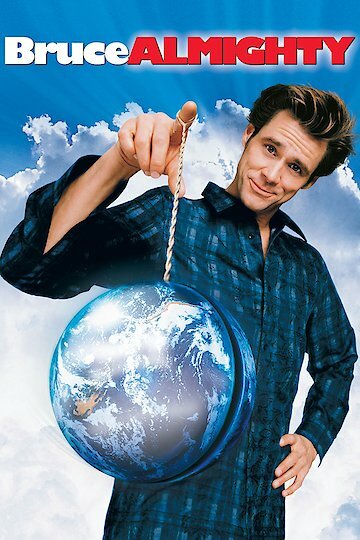 Bruce Almighty is currently available to watch and stream, buy, rent on demand at FlixFling VOD, Amazon, Vudu, Google Play, FandangoNow, iTunes, YouTube VOD online.